The most versatile, multi-material cutting quality table saw on the market. 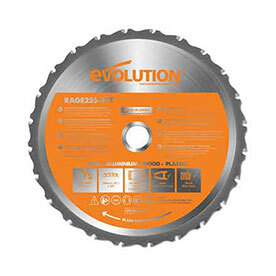 The RAGE5-S will easily cut steel, aluminium, wood, even wood with embedded nails and plastic, using just one blade. Excellent at ripping thin stock, making accurate cross cuts and handling sheet materials. Cut steel, aluminium even wood with embedded nails. With Optimized Gearbox & Blade System. For mitre & bevel cutting. 0° - 45° Bevel Tilt. With anti-vibration clamp for smooth cutting. with parallel, full-length rip fence. with built-in storage cable holder. Easy access On/Off safety switch. Capable of cutting large sheets. Accurate rip cutting, assisted by an adjustable, full-length, parallel fence with measuring rail guide. Powerful hi-torque motor with optimized gearbox & blade system. 0° - 45° bevel tilt and 60˚ - 60˚ mitre fence covers all common, compound cutting angles. 83mm depth of cut at 90˚ and 58mm depth of cut at 45˚. Integrated dust port above and below the blade captures dust effectively when fitted to a extraction unit / vacuum (sold separately). Collapsible frame with wheels for easy storage and portability. Left and right table extensions supports wide work-pieces with a table surface area of 1200mm x 640mm when fully extended. 1.5m durable cable with built-in storage cable holder. Push Stick included for safer operation when handling smaller off cuts. Will it cut thicker than 6mm (1/4”) mild steel plate? The arbor size of the RAGE5-S is 25.4mm. 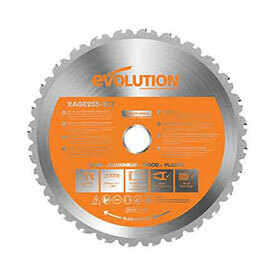 However, click here to see More FAQs about Evolution Table Saws or, Contact our team of experts based in Sheffield, UK.